Ulysses S. Grant, who knew something about battles, wrote that Shiloh "has been perhaps less understood, or to state the case more accurately, more persistently misunderstood than any other engagement…during the entire rebellion." Timothy B. Smith has spent a significant portion of his professional life working to correct Grant's perception. The latest compilation of essays, most of which have appeared before, continues Smith's stellar efforts to explicate this important Civil War battle. Some of the essays take a revisionist stance. Two deal with the myth and memory of the Hornet's Nest. "In actuality," Smith contends, "the Hornet's Nest's iconic status is a result of a few veterans' interpretation of the facts and that interpretation has been growing in reputation ever since." Smith concludes that "The evidence points to the fact that the Hornet's Nest was not the most vicious, important, or decisive engagement at Shiloh." Furthermore, after carefully examining the historical record, Smith declares "The soldiers themselves stated as much, the position of troops does not support the idea, and the casualties and burials firmly argue against such a notion." Smith takes a similarly clear-eyed approach to analyzing Lew Wallace's march to Shiloh on April 6 by actually taking a group of eight people and retracing Wallace's march and countermarch on that fateful day. It took the intrepid band of hikers, unencumbered with wagons, horses, and artillery, 15 minutes longer than it took Wallace and 5,800 fully equipped soldiers. "All doubt about the speed of Wallace's march," Smith declares, "should thus be muffled forever." What about the civilians who lived on the land where the battle was fought? Their story rarely makes the history books. Most fled before the fighting started but a few remained. "Several family stories have survived," Smith relates, "and they provide a clear picture of the horror and fright of being a civilian in the midst of a battle." After the battle, the victorious Union forces remained on the inhabitant's land for weeks, turning the homes and farms into "a vast cemetery." Almost all of the three thousand men who died during the battle were buried on the field. One of Smith's most insightful essays analyzes the importance geography played on the battle. 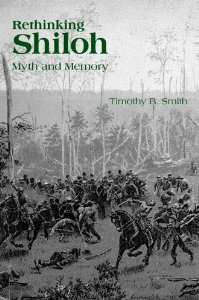 A careful examination of the terrain of Shiloh, both natural and manmade, leads Smith to propose "that it is quite possible the Confederates never actually had a chance to win at Shiloh." His essay on the New Deal's effect on Shiloh catalogues the remarkable transformation that remade an iconic battlefield into an outstanding National Military Park. Finally, most visitors to Shiloh National Military Park begin their journey by viewing the park's introductory film in the visitor's center. First shown in 1956 and retired only in 2012, “Shiloh: Portrait of a Battle” influenced how millions of people viewed and understood the battle. Its influence, Smith contends, "has been immense." Smith's writing is crisp and confident, his arguments convincingly supported, and his conclusions based on years of research. Reading Smith's essays is almost like having the blue and gray wraiths that ride on the mists of the Tennessee River and sometimes roll over the hallowed ground whispering in your ear about how it really was when uncommon valor was a common virtue.